I’d had my eye on this for a while and managed to pick up a copy a few weeks back. It was written and illustrated by the late great Joe Kubert back in 2003, but it’s still worth a look today. Before he was born, back in 1926 in Poland, his family tried to emigrate to the United States, but because his mother was pregnant, the family wasn’t allowed to get their visas and get on the boat. They tried again two months after he was born, and they were more successful this time. They made the long trip to America, and years later, Joe Kubert became a successful comic book artist and eventually founded his own school for comic artists. 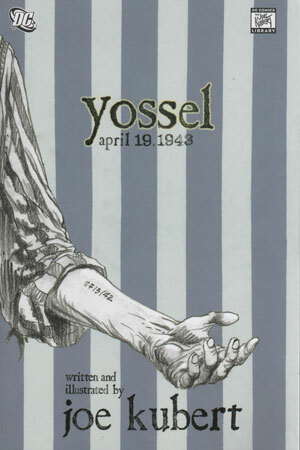 “Yossel” is the story of what could’ve happened if the Kubert family had never left Poland. As you might guess from the cover art, this is a story about the Holocaust — with the Warsaw Ghetto Uprising as its focal point — and it’s appropriately horrific. Things start slowly enough, with slowly mounting discrimination and oppression visited upon the Polish Jews. Yossel’s father is a butcher, and Yossel’s over-riding passion is art, but eventually, the Nazis order all the Jews in their village shipped off to a massive — but still too small to hold everyone — block of apartments in Warsaw. And of course, things get steadily worse and worse. There’s not enough food, there’s not enough of anything, and no one is allowed to leave — although Yossel actually receives permission to leave periodically. See, the Nazis like his artwork, so they bring him to their headquarters so he can draw for them. This earns him a few privileges, which he tries to distribute to the other residents of the ghetto. But when his family is finally shipped off to Auschwitz, he has to stay behind. Eventually, Yossel meets up with an escapee from one of the death camps, who tells everyone about the horrors that go on there. And from that point, it’s decided that the ghetto must fight back against their oppressors. Verdict: Thumbs up. It was clearly a deeply personal book for Kubert, who is basically imagining an alternate universe where he and his family are killed by Nazis. There are no great surprises here — we know what the Nazis did, we know the history of the Warsaw Ghetto Uprising — but it’s still a harrowing account of man’s inhumanity to man. And it’s also stunningly beautiful. The book wasn’t inked at all — Kubert decided he preferred the look of his rough pencils over the finished elegance of the inked product. Kubert wanted to make the drawings look like something Yossel would’ve drawn while observing the events around him, and it does do a lot for giving the story an air of authenticity. It gives the whole book a really unique look — rough and sketchy, but also more immediate, urgent, and even intimate. The emotions, body language, everything you see is more raw and painful — but it’s also utterly gorgeous, brilliant work. You’ll go back to this over and over to study what Kubert was doing. It’s a beautiful book about a terrible time, created by one of the comics world’s top artisans. You’ll definitely need to pick this up. Beg your local shop to find it for you, or go online to find a copy. Copyright © 2014 Hero Sandwich. Powered by WordPress and A Dream to Host theme by Art of Blog.